Pretty Boy: [discovering who the pilots are] The American pilots are African! RED TAILS, the movie about the Tuskegee Airmen that was produced by George Lucas, premiered today. My wife and I went to an afternoon matinée. We both enjoyed the movie. If the STAR WARS and INDIANA JONES movies were Lucas' attempts to recreate the serials of the 1930s and 1940s, then RED TAILS is his 1945 war movie. It has a very old fashioned feel about it, as if it had been made in 1945 and then stored away until now. I like that but not everyone does. The movie has received a lot of negative reviews from the professional critic class. 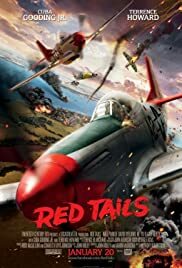 Many of those reviews dislike RED TAILS because of that old fashioned sensibility. Apparently, war movies made now are only allowed to be cynical and anti-war. 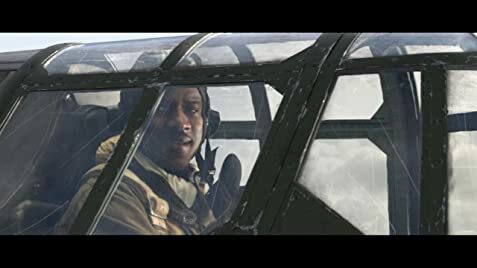 RED TAILS is neither anti-war nor pro-war, but it is definitely pro-heroes. There are no anti-heroes in this movie; the pilots and their ground crews are portrayed as real heroes. Some reviews opine that the characters are shallow and not well developed. Again, I did not feel that at all. The characters, including relatively minor supporting characters, seemed well rounded and each one unique enough that it was easy to tell them apart, even when they were in cockpits with helmets and oxygen masks covering much of their faces. Maybe some of the characters were stereotypes that we have seen in war movies many times before, but for me, that added to the period feel of the movie. Another common thread in the professional critics reviews is that they were unhappy that the movie did not devote more time to exploring the discrimination experienced by the Tuskegee pilots. I don't think this is justified, either. The movie does show the pilots experiencing discrimination, both institutionally in the way the Army assigned them missions and equipment, and individually in their interactions with other soldiers. However, it is also true that is not the main focus of the movie. The movie's focus is on the air battles and how that combat effects each of them in different ways. In interviews, Lucas has said that his intent was to show the Tuskegee Airmen as heroes, not victims. I think he succeeded. Okay, that addresses some of the issues that are clouding this movie. For some of us, the question is; are the air battles done well? The answer, IMHO, is a resounding "yes." In making the movie, they had three P-51 Mustangs, one B-17 Flying Fortress and a C-47 available for filming. Everything else is CGI or full scale mock-ups. As is to be expected for a movie which had its visual effects supervised by Industrial Light and Magic, the CGI is outstanding. Squadrons of B-17s, P-51s, P-40s, Bf 109s and Me 262s fill the sky and look completely real. The dogfights are shot and edited so that it is not difficult to follow the action. There is none of the super fast cutting that is the bane of so many action movies these days. There is plenty of air action, too, though it was not enough to satisfy me. Of course, they could have made the movie nothing but air action and I still would have wanted more. Is it a perfect movie? No, of course not. It has a couple of subplots (a romance and a prison escape) that are well done but not really necessary to the movie (though my wife would disagree with me about the romance). Some of the dialogue is a bit clunky, but what kind of George Lucas movie would this be if that were not the case? It is filled with beautiful aircraft, though, and for me that makes up for any shortcomings. If you don't mind a war movie that is not cynical but instead is about courage under fire and patriotism, then I think you will enjoy this movie. 156 of 294 people found this review helpful. Was this review helpful to you?